Rusty nails should never be used, as they will not be effective. 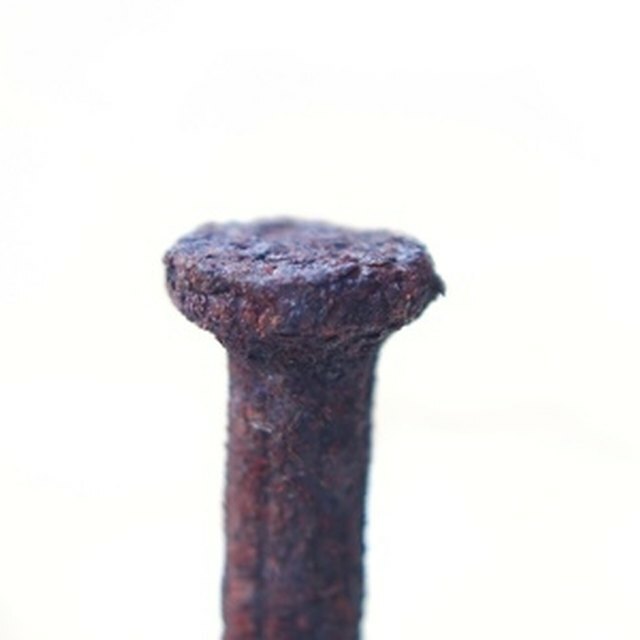 There are a numerous ways you can remove rust from a nail, however, depending mostly on how much rust there is. Rust can also be a problem for the heads of nails that have been used and are already in place; if they're in place on a painted surface, they can stain the paint. Here, you need to remove the rust and take steps to prevent the rust from returning. Sand away the rust on the nail head and any stained paint surrounding it. Use sandpaper or a wire brush. Applying an aerosol lubricant like WD-40 can also help. Countersink the nail so the head is actually below the surface of the flooring. A nail punch is designed to do just this. Punch the nail so it is about 1/8 of an inch below the surface. Cover the sunken nail with caulking compound and allow the compound to harden (the time needed will vary depending on the exact compound), then paint over the surface where you removed the paint; use two coats. Scrape as much of the rust off the nail as you can. Sandpaper will work best for the nail shaft. It can also work for the nail head, but a wire brush can work for that part also. Apply WD-40 or other oil-based lubricant to the nails. Spray the lubricant liberally and then wipe it and the rust off with a cloth. Make sure you do this somewhere where you don't mind getting the oil on the floor or table. Immerse the nails in soda pop. Coca Cola is believed to have chemicals in it that can break down the rust and remove it from the nail; it might not get all the rust off, but it should get a lot of it. Wipe the nails dry and try the WD-40 again on any rust that remains. These techniques can work for screws as well as nails.